Only 67 bottles of Rome de Bellegarde has been decanted with the very first 40ml serving being bought by Ranjeeta Dutt McGroarty, Gunniess World Records confirmed on their website. Are you willing to spend that much? How much are you willing to spend on one shot of liquor? 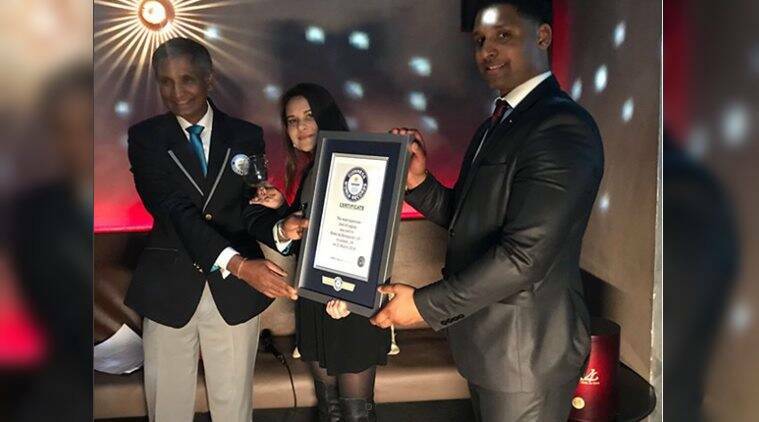 An Indian-origin woman created Guinness World Record after she bought one single shot of cognac for a whopping £10,014, that approximately converts to over Rs 9.20 lakhs, in current exchange rate! Yes, the record for the most expensive shot of cognac was achieved by Rome de Bellegarde (UK) in London, UK, on March 21, 2018. The 40ml serving of the rare and super-rich alcohol was sold at Hyde Kensington bar on Wednesday night, where Ranjeeta Dutt McGroarty, founder and director of Trinity Natural Gas had the pleasure of tasting the drink. Not only it earned the title for being the most expensive single shot of cognac, it is also one of the oldest cognac to be discovered in the world. “The pricey plonk was discovered in the cellars of cognac house Jean Fillioux by fifth generation cellar master Pascal Fillioux. It is believed to be the very first blend created by Jean Fillioux in 1894,” Metro reported. Cognac connoisseur and experts were invited to the event to witness the very first pour of the exotic drink. Only 67 bottles of Rome de Bellegarde has been decanted with the very first 40ml “serving being bought by Ranjeeta Dutt McGroarty,” Gunniess World Records confirmed on their website. “We are so excited for Rome de Bellegarde to be available for the first time in over 120 years, ” Rome de Bellegarde founder David Smeralda said. “Since its discovery in 2004, this incredible batch has been destined to be enjoyed by those that love and cherish truly pure cognac,” he was quoted in the report. The previous Guinness World Record for the most expensive cognac sold was for 68,000 Hong Kong dollars (£7,072) in China, on November 9, 2016. The Croizet Cognac “Cuvée Leonie” was bought by Jason Wong (Huang Guofeng), Chairman of Eyarn Lighting Ltd.